Event! 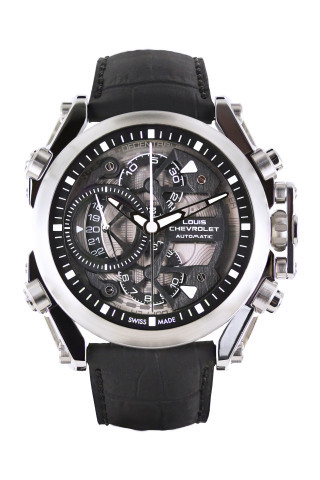 Louis Chevrolet Swiss Watches launches a Swiss Made automatic chronograph dedicated only to Bitcoin owners. An exclusive and limited-edition series to symbolise and affirm the unique sales channel chosen by the brand: its e-commerce store. Chrono-Tour Bitcoin Special Edition, a well-thought-out stylish design, elegantly bringing the Bitcoin to the forefront. In addition to a specific dial, a Bitcoin logo textured around a printed circuit board will be inserted into the back glass. This gives a technological holographic effect while highlighting the mechanics of the watch. The background will be personalised with a laser and will indicate the purchase price in Bitcoins at the exact moment of the purchase of the watch. Only 99 owners will have the privilege to wear this Swiss Made automatic watch, with a multi-layered dial and a Valjoux 7750 movement. The reference price based in Swiss Francs is set at 2,500. Louis Chevrolet Watch Company brings together the know-how of the Swiss Jura, Louis’ place of origin. Thanks to the experience and traditions of the region, the company fully controls the manufacturing process. The technical and aesthetic features of our watches are developed in our own workshops. We manufacture most of our exterior watch parts and also decorate all our movements internally. Our process ends with the assembly and control of our timepieces.